Homelessness Jumps in City, County of L.A.
Homelessness in the city of Los Angeles jumped by 20 percent over the last year while the county saw a spike of 23 percent, according to the results of the 2017 Greater Los Angeles Homeless Count released Wednesday. The homeless count took place over three nights in January and was conducted by the Los Angeles Homeless Services Authority, which saw a record number of volunteers— totaling more than 8,000 — participate. “Today I am not discouraged at all by this data. We knew well intuitively that the uptick could be perceived,” said county Supervisor Mark Ridley-Thomas. Officials acknowledged the rising cost of housing, along with a housing shortage, as a top cause of the homeless problem. Los Angeles has not built enough housing or affordable housing over the last decades to keep up with the increasing population, making the city one of the least affordable in the nation. The count is required to be done every two years by the federal government, but LAHSA went to an annual count last year. LAHSA is in charge of the count for what is called the continuum of care for the entire county except for Glendale, Pasadena and Long Beach, which conduct their own counts. But the newly released number for the county included the results from those three cities. El número de personas sin hogar en el condado de Los Ángeles aumentó 5,7 por ciento en el último año para llegar a 46.874, según los resultados del recuento de personas sin hogar en Los Ángeles 2016 publicado el miércoles. La cifra aumentó de 44.359 en 2015, según la Autoridad de Servicios para Desamparados en Los Ángeles (LAHSA). La gran mayoría de las personas sin hogar en el condado—34,527—no tienen un techo, comparados con 31.025 en 2015. A pesar del aumento general, la falta de vivienda entre los veteranos se redujo en un 30 por ciento en todo el condado, de 4.362 en 2015 a 3.071 este año. En la ciudad de Los Ángeles, el número de veteranos sin hogar se redujo a 1.617, en comparación con 2.733 del año pasado. Sin embargo, en la ciudad de Los Ángeles en general se registró un incremento del 11 por ciento en el número de personas sin hogar, a 28.464, lo que representa el 65 por ciento del total del condado, de acuerdo con el recuento. De personas sin hogar de la ciudad, 21.338 no tienen un techo donde dormir. El valle de San Fernando enfrentó un aumento del 35,2 por ciento, mientras que el Valle de San Gabriel vio una disminución del 15,7 por ciento. La falta de vivienda de familias en todo el condado se redujo en un 18 por ciento con respecto al año pasado, según el informe. “El éxito de Los Ángeles en la reducción significativa de veteranos y familias la falta de vivienda refuerza la importancia de los recursos y el sistema de colaboración para entregarlos”, dijo Peter Lynn, director ejecutivo de LAHSA. “La falta de vivienda responde a los recursos. Cuando hemos aplicado sistémicamente recursos locales, del condado y federales, se ven los resultados. Estos son programas modelo para tomar ventaja y replicar al trabajar con nuestros socios de ciudades y condados para incrementar los recursos de asistencia de los desamparados y la inversión estratégica mediante sistemas coordinados”. The Commerce City Council on Tuesday approved a resolution to participate in the 2016 Greater Los Angeles Homeless Count taking place Jan. 26 to Jan. 28. The Los Angeles Homeless Service Authority (LAHSA)—a City and County of Los Angeles joint power authority formed to address homelessness—is diligently working on its annual homeless count in the City and County of Los Angeles. In 2009, LAHSA expanded its Opt-In provision to allow more local cities and communities to coordinate homeless counts within their borders using local volunteers from public and private agencies. In 2015, 248 cities and communities—including neighborhood councils—enumerated all of their census tracts. This year, about 126 cities and communities —including Bell Gardens, Monterey Park, East Los Angeles, Boyle Heights and Northeast Los Angeles — have signed up to take part, according to Kimberly Barnette, LAHSA regional coordinator. She told EGP they are still working on getting the cities of Montebello and Vernon to join the massive effort. 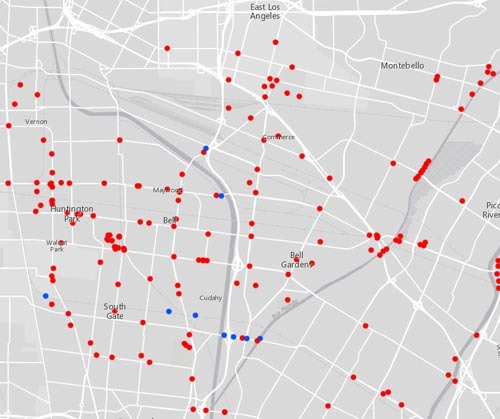 The Opt-In Program makes it possible for LAHSA, with a high level of confidence, to obtain specific data and totals on the homeless population in every census tract in a city or neighborhood, according to LAHSA spokesperson Naomi Goldman. Barnette—who made a power presentation about LAHSA’s homeless count to the Commerce Council Tuesday—said they have already identified hot spots for homelessness, some of those areas are near Rosewood Park and Atlantic and Washington Boulevards. In 2015, LAHSA identified over 44,000 homeless living in the Los Angeles regions. Those numbers do not include Long Beach, Pasadena or Glendale. During the last homeless count, LAHSA identified 52 homeless in Commerce, all of them adults; 20 living in campers, 15 in vans and cars, 9 on the street, 6 in encampments and 2 living in tents. Over the past two years, Commerce has made assisting the homeless a priority, said Matthew Rodriguez, director of public safety and community services with Commerce. “We have reached out to as many as possible and have had success with placement in local shelters,” he told EGP, explaining that outreach is conducted through the city’s Social Services Department. According to Rodriguez, staff refers the city’s homeless to the Salvation Army’s 70-bed shelter in nearby Bell or connect them to the People Assisting the Homeless (PATH) agency in Los Angeles. Councilwoman Tina Baca del Rio, however, said she is worried that the homeless people in Commerce may not want help because they have found a way of living by earning easy money. “Panhandling has become a way of life [in Commerce]…[homeless people] say they get a lot of money from people that go to casinos,” she said, asking Barnette to have LAHSA look into that issue. “Maybe they can get more services instead of relying on panhandling,” she said. By opting in, Commerce will be responsible for counting all the unsheltered homeless people in the agreed-upon census tracts. They also need to find a deployment site, select a site coordinator and recruit volunteers. Rodriguez told EGP Commerce has already taken care of almost everything, but are still in need of more volunteers. He said Commerce residents interested in helping can sign up with the Public Safety and Community Services Department located inside City Hall. Along with volunteers, about 15 city staff and Sheriff deputies will take part in the count, said Rodriguez. “There are some areas where we don’t want to send volunteers, so it’s better if the officers go there,” he added. While Commerce has participated the past three years in the homeless count, this time is different, City Administrator Jorge Rifa told EGP. LAHSA expects to deploy about 6,000 volunteers during the three-day count in the city and county. 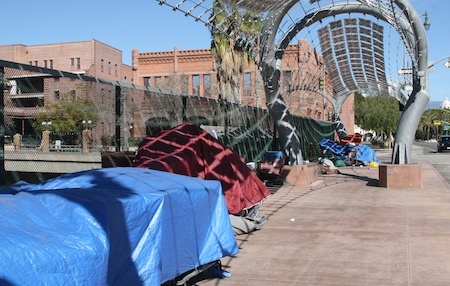 Since 2005, LAHSA has coordinated six biennial homeless counts, however, starting 2016 the count will occur annually, according to the agency’s website. For those interested in volunteering or to obtain more information about the 2016 homeless count visit, www.theycountwillyou.com.